Pegasus Potion is a new concept of nitrogen delivery. Extraction through enzyme hydrolysis makes Pegasus Potion more biochemically viable, preserving amino acid integrity by breaking proteins at specific sites. This is the first pure-nitrogen product on the market that is not a salt based mineral or urea based nitrogen. Incredibly gentle on plants’ foliage and root zone, Pegasus Potion provides a readily available amino acid nitrogen source. Pegasus Potion can be used as an extremely effective foliar spray as well as a root drench to promote greening and vegetative growth. A little warning to all who are thinking about using Pegasus Potion: IT SMELLS REALLY BAD. We have done everything in our power to quell the stench, and nothing we have tried will mask the smell. Sorry. 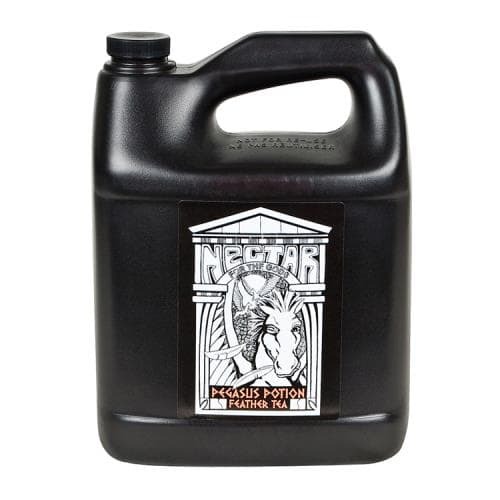 Pegasus Potion, from Nectar for the Gods, is an enzymaticly digested Feather Meal Tea. Consult the FEEDING SCHEDULE for any questions or give us a call.